"Sleek, fashionable and trendy watch that is sure to be one of the most appreciated gifts one can give, receive or self treat. The images do not capture the real beauty of this stunning watch. 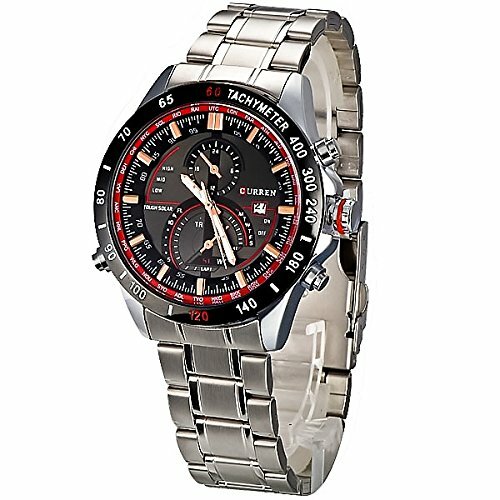 The exciting design of the watch is simply a lot more trendy and elegant.Features: * New brand with high quality * Round dial, fashion & casual * 2 small dials can not work, just for decoration * Precise quartz movement for accurate time keeping * Beautiful bracelet design and comfortable to wear * Band Material: Stainless steel * Case Material: Stainless steel * Daily water resistant Size/Measurements: * Case diameter(cm): approx 4.4 * Case thickness(cm): approx 1.2 * Band length(cm): approx 22 * Band width(cm): approx 2.0 * Watch weigt(g): approx 123 Package included 1* Wrist watch"
If you have any questions about this product by fongshop, contact us by completing and submitting the form below. If you are looking for a specif part number, please include it with your message.